Can you balance your nutrition for a long trip, and at the same time keep your meals quick and hearty? How to whet your appetite whilst keeping your backpack to the minimum weight? Dehydrating food may be the kind of food that you’re searching for. Is it okay to eat dehydrated foods on regular basis? The answer is, ABSOLUTELY OKAY. Dried food can retain the vitamins and minerals throughout the whole year, without requiring any additives at all. And because the water is dehydrated, the taste is concentrated; therefore giving the food a deliciously bold flavor. Using these foods also allow you to build the basics of meals that don’t need to be cooked. Quick, tasty and healthy – I don’t see any reason to hesitate putting dehydrated food on your menu. Amaze yourself and friends with new culinary creations! There are two advantages that make dehydrated food outrun other ingredients when it comes to outdoor activities: light-weight and quick-prepared. Out of tons of options for dried food, I had picked up these 6 types of dehydrated food that are meant for camping and backpacking. They are easy-preserved but guarantee to supply enough nutrition for a long tiring trip. Stands out for the extremely lightweight meat, no refrigerating burden. Beef jerky is a great source of protein, fat, and carbohydrates. You can choose meat strips for a chewy taste; or use ground meat – it can be a good combination with vegetables. 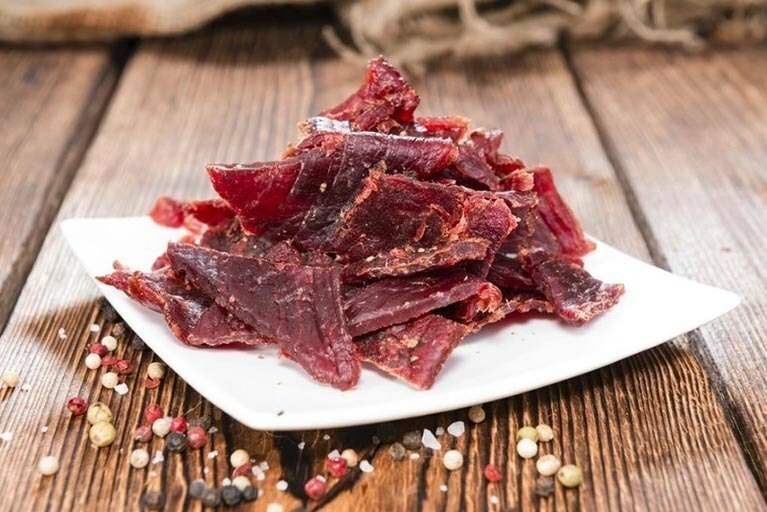 Beef jerky can be the ingredients for many recipes too. Use it as the main protein for your soups, chop them up to boost the flavors for salads or roast them with vegetables, you’ll be surprised at the exploding taste! Feeling like a treat after a hard work day? A bite of beef jerky sandwiched with a slice of cheese and a cracker will amaze you! Stands out for nutritious variation, great health benefit. 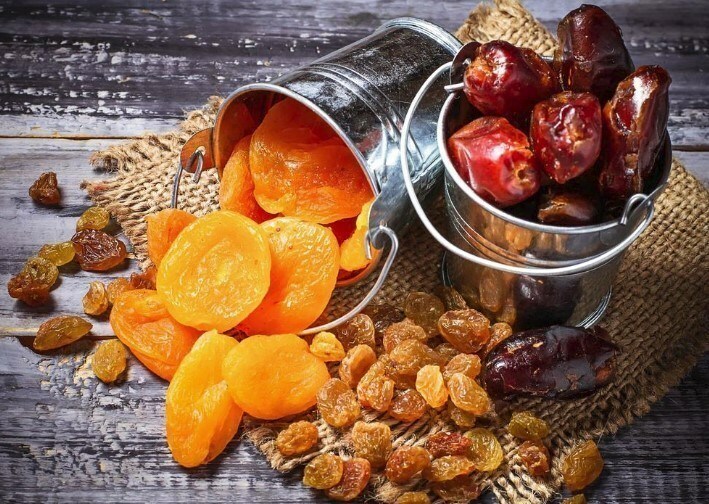 Dried fruits contain multiple vitamins as well as provide you fructose (a natural sugar that converts into energy). Comparing to fresh fruits, they are more durable and there is a lot less to pack – which is a major point for camping and backpacking. Three of the most used dried fruits for backpacking are apples, raisins, and bananas – as they come in the variety of taste and can be stored for a very long time. The simplest way is to serve them for desserts as fresh fruits. You can add them into oatmeal or trail mix for a healthy and delicious breakfast. They are also flexible enough to be used with peanut butter and cheese. Stands out for quick muscle building recovery. These bars are the perfect food if you are so exhausted along the way and need to recover from the physical exhaust. They are packed with much protein to help you get the energy you need to continue the journey. 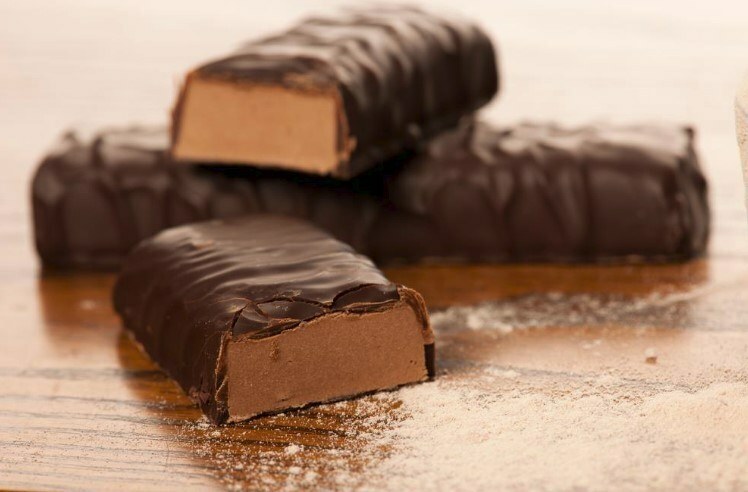 Eat a bar between your breaks during a hiking trip or within grueling activities, you will receive an immediate boost of energy to continue your day. And don’t refrigerate the bars before the trip if you don’t want them to melt in your backpack. Stands out for providing great protein and fat – without cholesterol. 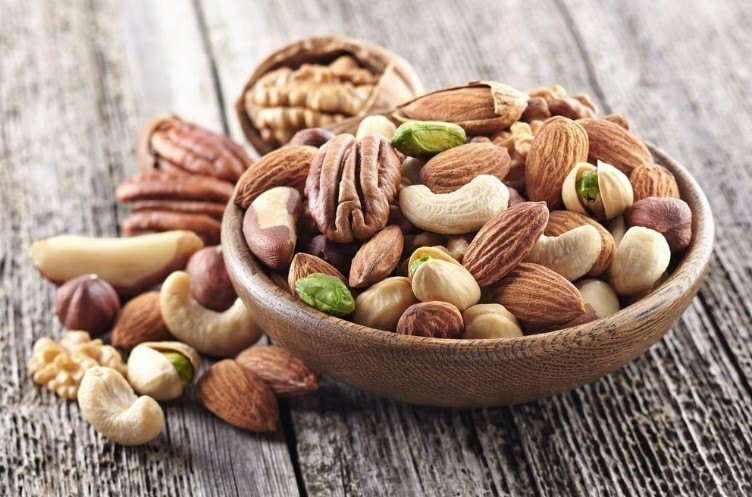 Nuts and seeds are an incredible source of healthy fat, and they promote a healthy immune system by restoring nutrients and calories. And I’m just naming a few. Have a handful of nuts as a delicious snack food. You can also use them as food ingredients to add a crunchy texture to granola, salads or pasta. Stands out for a sweet taste that comes in a variety of mixtures. 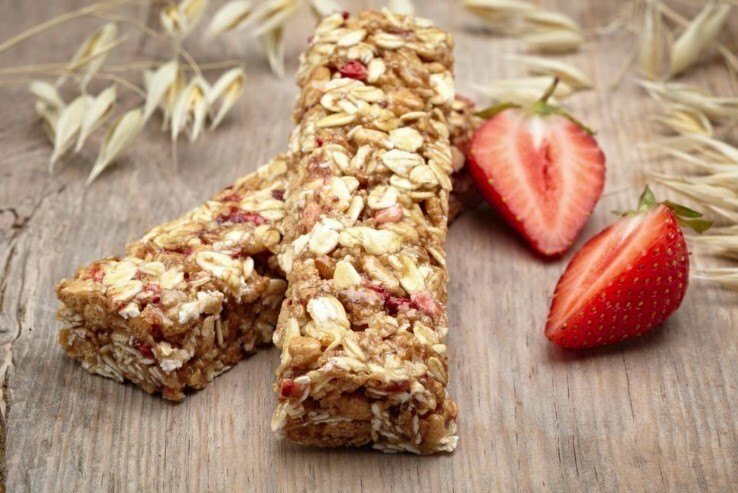 While protein/ nutrition bars are designed to boost your energy up immediately; cereal bars do not provide quick burst, therefore are free from caffeine or supportive nutrients. But they are nutritious indeed! There are also more flavor options to choose from: Greek yogurt, honey, fruit extract – all perfect combining with granola, wheat flakes or oaks. The cereal bar is a perfect way to start a new day. You can save yourself from the cleaning fuss and still have a yummy and nutritious breakfast. Of course, you can also step out of the line and dip them into yogurt, coffee or milk for a refreshing taste. Stands out for low cost, all kinds of variation. Also known as gorp, this kind of food is extremely low cost since you’d probably have all the ingredients at home. These are truly the ideal food for camping or backpacking because it’s easy to eat, you can mix and match it to your taste, and it also provides quick carbohydrates boost. 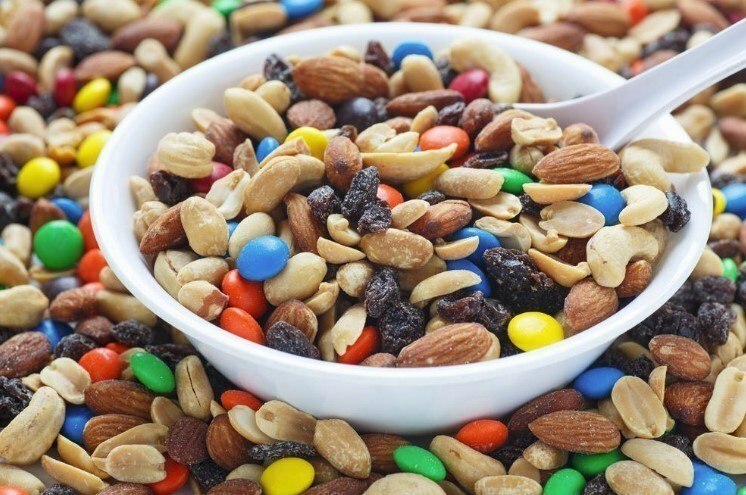 The best way to get trail mix is to mix it with your favorite foods! Combinations of all-time favorites include M&M’s, chocolate chips, mini marshmallows, Cheerios, raisins, peanuts, and cashews. Dehydrated food is a great assistant for you to prepare your meals along the way. Save yourself some time and money as these dehydrated foods for camping and backpacking not only are fast to prepare but cost you at a fair price and come with a surprisingly delicious taste.